Today was the last floral design workshop until Fall. Discussion was focused on the element of proportion and the design we created was The Parallel. This design is recommended to be created in a 12-inch long rectangular dish that is 2 inches high, using three 2.5 to 3-inch floral pins, aligned in a row. Our containers instead were round, posing a slightly different challenge. The next garden club meeting will feature a Members’ Flower Show, the first for the club in many years I understand. I will enter one of the four designs we studied in this year’s workshops into the “New Sprouts” class, but have not decided yet what design that will be. The plant material for today’s exercise was Bells of Ireland, Carnation, Liatris, Snapdragon and variegated leaves whose name I forgot to record. 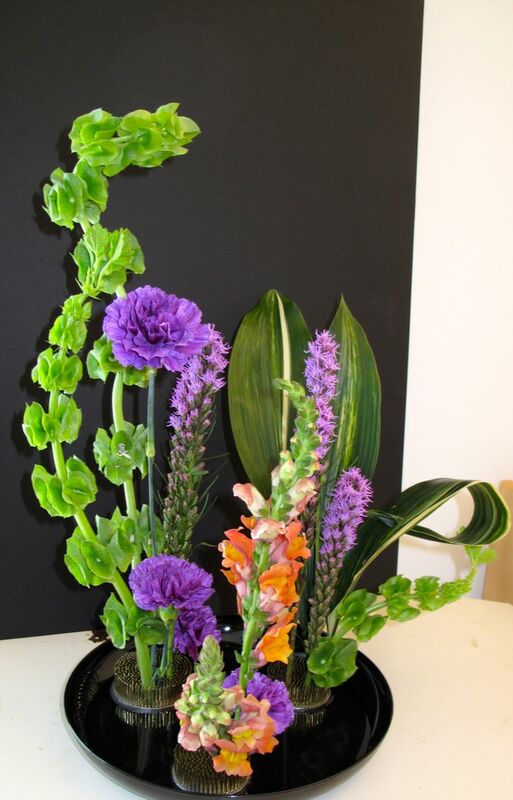 This entry was posted in garden and tagged floral arranging, Floral Design, parallel design on May 14, 2013 by pbmgarden. The darker background really makes your colors pop and makes the floral elements seem more striking…I really love what you did, it is really fun to look at. Isn’t it amazing how we are always a bit more of an expert when we are looking at someone else’s work. I should really just leave it at I like looking at what you did, I find it really pleasing. I suppose any colour background could be used to create a contrast, but the black is quite effective. The light reflects so differently! Very interesting project that can perhaps help in garden planning too…. 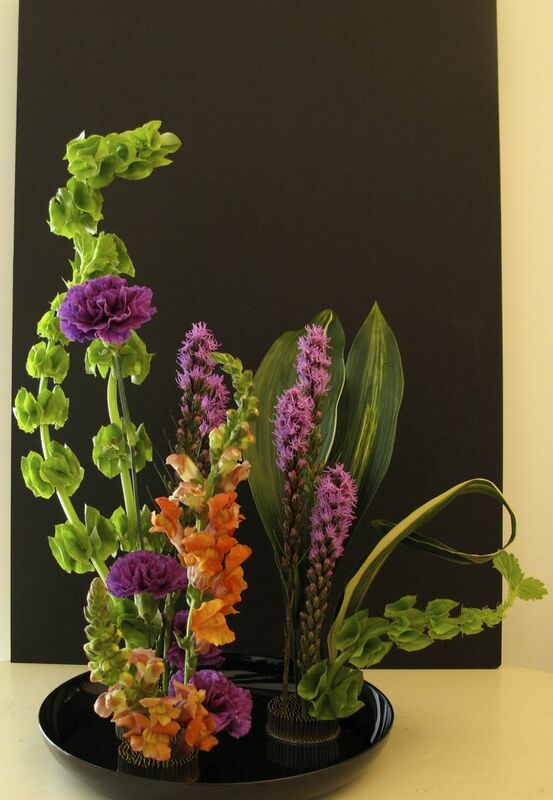 A stunning arrangement and the black background sets it all off beautifully making the colours really shine out. I like the different textures you have used, did you take your own material or was it provided for you? Thanks Pauline! The teacher selected the plant materials and got them through a wholesaler for us. This is helpful so we can focus on the design. After I finished photographing I filled the container with more water. 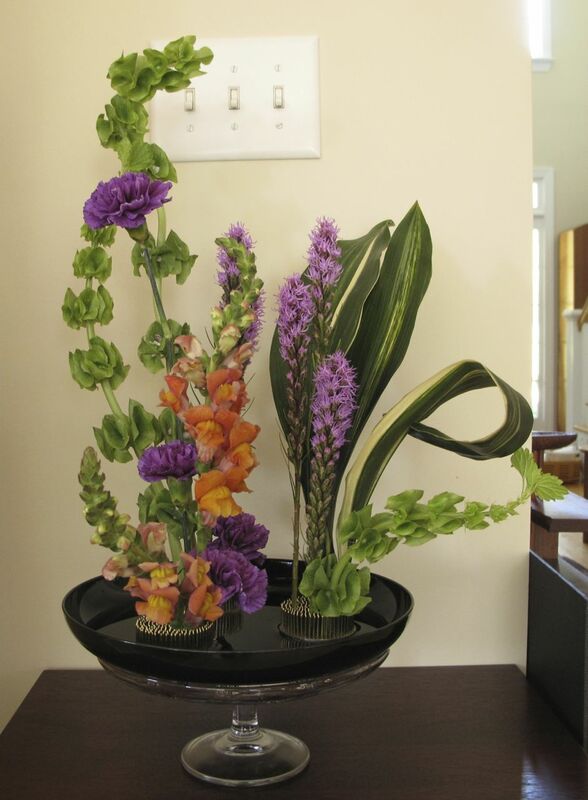 The preferred container would be 2-inches tall so it would be easier to submerge the stems. The pins are left showing, although I was supposed to bring some small stones to scatter around the bottom. The teacher said you don’t have to use many stones though, just a few to distract the eye. Lovely arrangement. The green Bells of Ireland against the black background is wonderful. Love your header photo too. Thanks Judy. I like the bells of Ireland too. Aren’t they amazing?